Last August, amid a flurry of reports by property gossips on both coasts and around the world, steel magnate Leroy Schecter wanted $95,000,000 for his not yet fully-combined two-unit combo-condo at the hideously high-priced 15 Central Park West building in New York City. He hacked the price to $85 million in early April (2013) before he took it off the market a few weeks later. The 35th floor aerie is back on the market for $85 million but it's also, as first reported in the New York Observer, up for grabs as a rental for a throat constricting $125,000 per month. 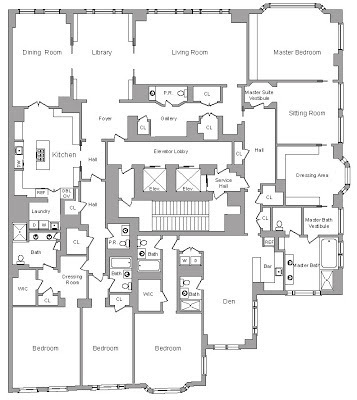 The now combined, suburban macmansion-sized apartment has, according to the floor plan included with current online listings, 4-5 bedrooms and five full and two half bathrooms plus four park-facing rooms (living, dining, library, master bedroom), three exposures (east, south and west), two laundry rooms, and more than a dozen closets—many of them walk-ins. Mister Schecter, a well-known real estate baller, was recently outed as the $25 million buyer of the 11,000-plus square foot Rothschild mansion on E. 70th Street. The octogenarian real estate baller also owns a train station sized water front mansion with 7 bedrooms and 14 toilets on the prestigious, guard-gated Indian Creek Island in Miami Beach that he listed in May, 2012 for $45 million and reduced in May, 2013 to a still sky-high $42 million. 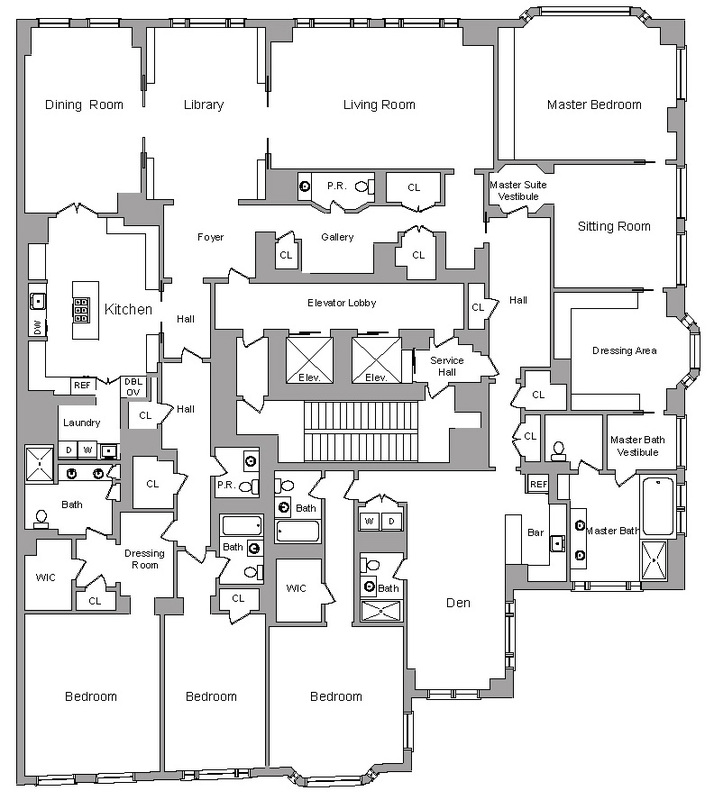 In the apartment, it looks like it's closer to go from the master bedroom to the powder room off the foyer than it is to go to the master bath. I'd trade the MBR and sitting room - have the bed nearer the biffy and be able to enjoy the windows in the (now) sitting room. 1:27, exactly what I was thinking on the distance from MB to M-Bath. Should be daunting on Chili nite. I don't get this entire deal. He's vacillating between renting each unit, trying to sell both (correctly combined), hitching up the price, blah, blah, blah. There's a divorce finalization weaving around this too. The guy's accountable to no one. I have some maternity clothes -- dry-cleaned and boxed. Just lemme know and they're yours. Even have a couple Lily Pulitzer's mixed in, just in case you hold a press conference down there. Think I can find a couple headbands to match. What is a Master Bath Vestibule? What do you do there?